I enlisted in 1972 and served during the Vietnam War Era. 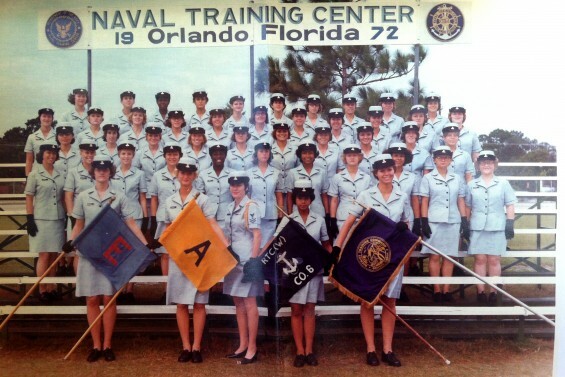 I was the first woman in the Navy to carry a gun. They didn’t even have a gun belt for me, I had to stick it in my skirt. I had a four-year commitment but got out early after two years as I was an only child and my father had a heart attack and died, so I had to go out and take care of my mom. After that I returned to the Navy Reserves and finished out my tour of duty. I went on to work for the Department of the Interior, the National Park Service, as a tattoo artist, as a Police Officer injured in the line of duty and finally I retired from the Department of Corrections. 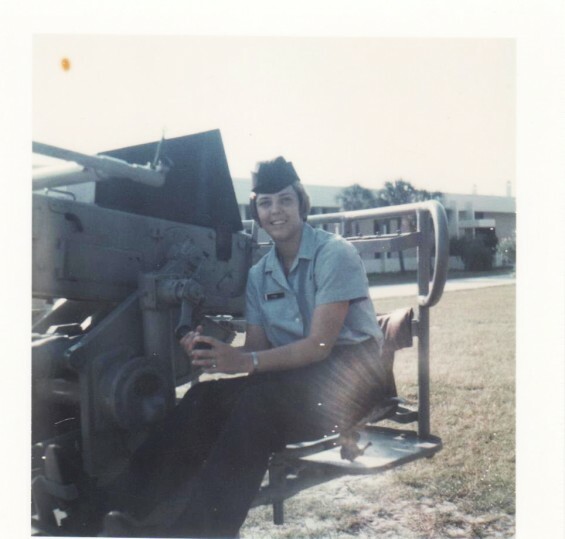 I knew other women in the military and I had one friend who said if she had to do it over again, she would have stayed in the military for the 20 years and still would have been young enough to have another career. I thought that sounded like a good deal. I chose to go into the military to provide for my future. I had no other way to pay for my education so I used the Montgomery GI bill to go to college. When I realized I was gay I was 16 and had just started dating. I’ll never forget this one time I was sitting in the back of the car with my boyfriend, and there was this girl sitting in the front seat with her boyfriend making out. I remember the whole time I’m in the back kissing my boyfriend, I’m wondering what the girl kisses like in the front seat. And I don’t think you’re supposed to think those things, I think you’re supposed to be into your boyfriend, but I wasn’t. I was always an athlete and back then really the only way you could meet other people who were gay was through athletics. Playing softball, basketball, volleyball. So you would join those teams and socialize with those other athletic women. As far as growing up in Memphis back then, it was a great place to grow up. You know Elvis? Elvis was there and a lot of the jazz and blues and there was a history to Beale street. It was a great place then, but it’s not like that now. Basically, the military was no different from living your everyday life wherever you were as a civilian. We all lived in fear. I knew a young girl, who when her parents found out she was gay, they had her committed to a mental institution. If companies found out you were gay, they would fire you. If your parents found out, they would disown you. If people generally found out, you could be beat up on the street. So, why was the military any different? One of my first memories of being gay, it was at Christmas time in the mid 1960s, there was this cute little girl that I liked. I was driving around and I asked her if she wanted to go and look at Christmas lights. And she said yes. And back then, cars were quite large, seats were like 6 feet across. She was sitting over there and I stopped in this neighborhood where there were lots of pretty lights and I remember she said, wow, this seat sure is wide and I said well, why don’t you scoot over and I thought, wow, was that me talking? And she did. And then we started kissing and a car drove by and we were deer caught in headlights. We froze. Then we ended up going home, and I got in bed and I laid there and I thought about that night. Back then the word queer was very much associated with lesbian and I said, well, I guess you’re queer now, aren’t ya? And then I said to myself yeah, well, so what, it feels pretty good. And that was as traumatic as it got for me, I didn’t have an issue with coming out. And then, the people that I chose to associate with were pretty much gay and I don’t remember any real incidents that happened because of it. I never lost a job because of it, but I wasn’t out there either, I was very careful. I never came out to family. I didn’t want to be put in a mental institution for one thing, like my friend had, and I don’t feel the need to tell them anything about my sexuality, my biggest focus was always leaving home. I was always a very independent person and I couldn’t wait to turn 18 and move out on my own, which is what I did. I went into the military when I was 20 years old. In Memphis there was one gay bar. There might have been one just for men, I don’t know but generally the men and the women went to the same bar so that they could cover for each other if the police came in, and this one was called the Famous Door. When you pulled in the back you’d see the back entrance before you’d go around to the front entrance which was right on the main street, but there was never any parking in front of it. And if there was a mop in a red bucket sitting on that back porch, then that was our signal to let everyone know that the police were around. When you were inside, of course, the men would sit on their side with their friends and the women with the women, but if they announced it or if the signal was given, we would jump up and swap tables so that there would be some men and some women sitting at each of the tables. I have been there when the police came in but there were never arrests or violence. We had already done our switch and we just waited for them to do their little walk through and leave. Now in the military, Naval Investigative Services went out all the time to the gay bars. They would cruise through to see if there were any military people in there, but of course we would all wear civilian clothes so they would have to talk and ask around and be nosy to try and find out. We were always aware, they were called witch hunts. They didn’t even need reason, you just needed to be in the establishment. 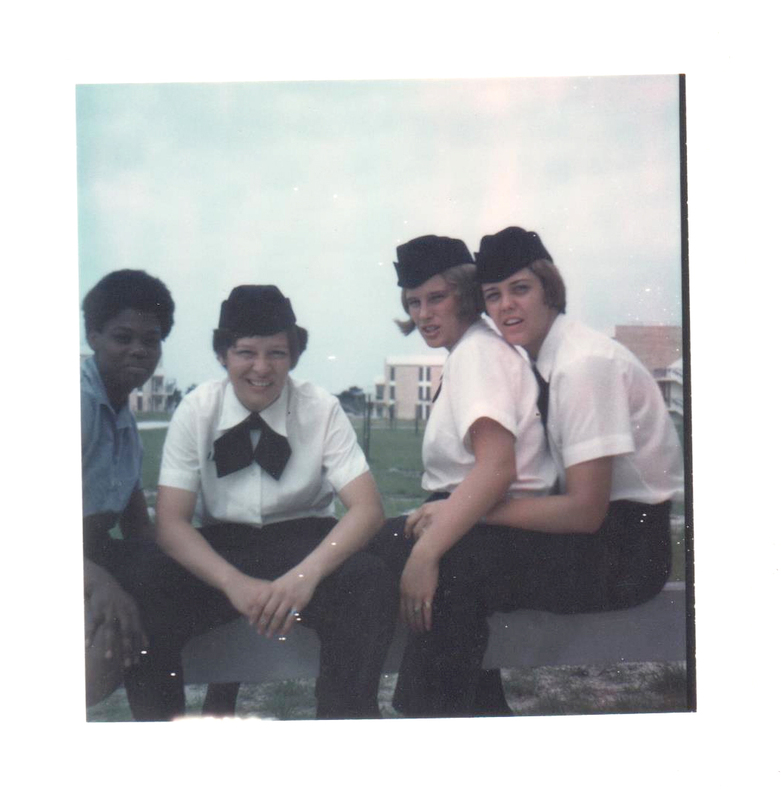 That was enough to get a dishonorable discharge, so it was very risky but everyone was so lonely and so desperate to socialize with other gays and lesbians that we took that risk. I was held over during bootcamp. There was a small group of us and we were lesbian and one of them had written a letter. I had never read the letter but she put it under the company commander’s door. It named names. And then we were all brought in and individually questioned about whether or not we were gay. I remember two things they brought up to me. One thing is, you know how they would cut your hair? For the men they would just shave it off and they would call that a butch haircut. And I don’t think it had anything to do with butch or femme, it was just called a butch haircut, and I had used the term one time time referring to the haircut. And another time, I had been playing basketball and had sprained my ankle. And in going back and forth to the gym, we rode a bus. When I went to stand up on the bus, my ankle gave way, I fell on the seat, and my hand landed on the knee of the girl sitting next to me. Well, then her report was that I was flirting with her when I put my hand on her knee, which was not the case. But they presented me with those two things and I explained them. They were out to get me if they possibly could. They said my name was in the letter and I said well, I haven’t even seen the letter, I don’t know what you’re even taking about and they were trying to pressure me into giving them everyone’s names who might be gay. I just pretended like I didn’t know anything. I didn’t give up anybody and eventually they left me alone. But they did hold me over a few weeks after bootcamp because my first duty station was supposed to be Annapolis, Maryland and I lost the privilege to go there and I ended up going to Dam Neck Virginia. Back then Annapolis was a wonderful place to be stationed because that’s where the officer’s bootcamp was, it was a huge naval center. I thought it would be quite exciting to go there. People were discharged as a result of that letter, and they were dishonorable. There were five or six people mentioned in that letter and there were two that I know of who got dishonorable discharges. They never even saw them in any act, it was just because the shadow of doubt had fallen on their heads. Well, it’s just like anything in your everyday lives. Like if you have a job and you need that job to pay your bills and meet your needs and you trust that that is going to continue. And then at any moment, someone can just come up to you and say sorry, you’re out. No more money, no more checks, and not only that, but you have this stigma now hanging over you. With a dishonorable discharge, you receive no benefits for the rest of your life, no matter what happens to you. Whereas with an honorable discharge, say the day comes where you want to apply for a pension, or aid in attendance, or any of the things that the military offers. I went into law enforcement. I would never had been able to go into law enforcement if I had had a dishonorable discharge. Any job, any type of really good job that requires a background check won’t be an option. With a dishonorable discharge, you don’t get anything. It affects your entire life. It came to me in a dream, that when you leave this body, you’re still the same being. My friend, she showed me a place where artists go, it’s Indigo. You can take your skills there, you take your artistry a step beyond. It’s a place of healing.